Adventures in Sound: What is an ocean drum? Some years ago I helped to set up a 'music and movement' project with the grand ambition of bringing sessions to a 'culturally deprived' rural area. At least that's what it said on the funding application: one has to choose the language and buzz-phrases of the moment if one wants to get the gig. Our client base included adults with learning difficulties and Downs Syndrome and I wanted to get satisfyingly tactile and chunky instruments, both for them and for the other beneficiaries of the scheme. Amongst the kit I amassed was a 22" ocean drum made by Remo. 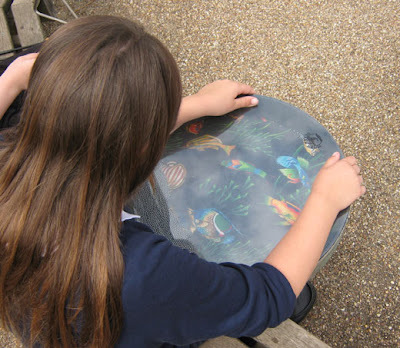 As a child did you ever roll marbles or pebbles around on a metal tray? There is something fascinating about the way in which the weight shifts as they roll or slide about the surface. And of course the sound. To be honest, and with apologies to Remo and other manufacturers and suppliers to the music stores of the western world, it never really said 'ocean' to me. Even now it's a name that rankles slightly - too literal and too leading. The main problems with a tray of marbles from an educational point of view are firstly, it's not especially portable and secondly, there's a strong chance of spillage and all that entails. 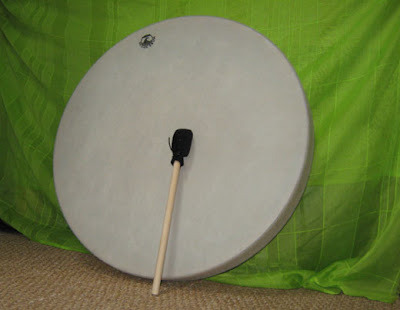 Enter the ocean drum, the shape of a bodhran but with a skin on both sides. There are dozens of ball bearings inside the drum and these roll around to make distinctive sound. They come in various sizes with 12", 16" and 22" being common, at least in the UK. although the 22" (About 55cm) never fails to impress primary aged children, by virtue of its size alone, they can find it rather unwieldy. Children also seem to like the ones with pictures of sea life visible inside. Personally I find them rather kitsch (Finding Nemo anyone?) and even more prejudicial to proper listening than the name. They actually originated in Nepal, a land-locked country in the Himalaya and a long way from the sea. The intention was, however, to imitate the sound of water. You can hit them with a soft beater like the one in the picture. You cannot hit them hard with a drumstick without risking splitting the skin. Treading on them is also out. If you hold one in both hands and shake the ball bearings vigorously between the two skins it produces a loud sound like thunder or crashing waves. They can have a very calming affect on fidgety or agitated children and those with SEN (special educational needs). They have a mesmerising quality. Lying down and watching the ball bearings roll around from underneath is rather like being under water. Although they are given all sorts of aquatic associations, don't leave them in a cold damp place for any length of time. I did and the ball bearings went rusty. It still sounds as good but, if you lie underneath, it feels more North Sea than Mediterranean.